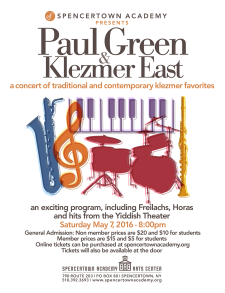 Spencertown, New York— Spencertown Academy Arts Center presents Paul Green and Klezmer East on Saturday, May 7 at 8:00pm. The concert will spotlight traditional and contemporary klezmer favorites, including Freilachs, Horas, and hits from the Yiddish Theater. Directed by clarinetist Green, Klezmer East features Pete Sweeney (drums), Bruce Krasin (saxophone), and Alan Gold (piano/keyboards). General admission tickets ($20/$10 for students) may be purchased in advance via www.spencertownacademy.org and will be available at the door. Clarinetist Paul Green’s career spans jazz, classical music, and klezmer. In addition to his work with Klezmer East, Green co-directs A Summer Celebration of Jewish Music, which presents a wide variety of Jewish music throughout the Berkshires and he is first clarinetist of the Atlantic Classical Orchestra in South Florida. He performs jazz widely throughout the Berkshires and South Florida, appearing at Barrington Stage, Colonial Theatre, Gateways Inn, Red Lion Inn, Florida International University, and Lynn University, among other venues. He is an active teacher as well, having taught courses at Williams College and Bard College at Simon’s Rock. He is a member of the faculties of the Hotchkiss School in Lakeville, Connecticut, and the Berkshire Music School in Pittsfield, Massachusetts. Pete Sweeney is a drummer, author, and educator who performs in every genre of music. He has performed, recorded, and toured with many outstanding artists, such as Pat Metheny, Lee Ritenour, Robben Ford, Frank Gambale, Duke Robillard, Ronnie Earl, “Dangerous” Dan Toler, Ed Mann (Frank Zappa), Andy Summers (The Police), Mick Goodrick, Malcolm Cecil, Laurel Masse, Steve Bailey, John Abercrombie, Jay and the Americans, Larry Coryell, Murali Coryell, Johnny “Clyde” Copeland, Lorne Lofsky, and Ray Vega. He is also a member of the Latin group Sensemaya. In addition to his performing, Sweeney has written 18 drum instructional books for the Alfred publishing company, as well as produced three DVDs. He has numerous instructional lessons online with Workshoplive. He is also a faculty member of the Berkshire Music School and Bard College at Simon’s Rock. Saxophonist Bruce Krasin has performed extensively throughout the world as a soloist, orchestral and jazz musician. Educated at the University of Massachusetts and the Berklee School of Music, Krasin has toured New England with Tony Bennett, toured Belgium with “The Young at Heart Chorus,” and toured Russia with the Jeff Holmes Big Band. He has appeared on the NBC “Today Show” with Katie Couric, and has performed with a wide variety of ensembles, including the Amherst Jazz Orchestra, the Keene State College Jazz Orchestra, Phil Wilson’s Thursday Night Band, the Roy Pomeroy Studio Orchestra, and the Commonwealth Opera Orchestra, among others. He is currently a faculty member of Smith College and Greenfield Community College. Alan Gold is one of the most prominent klezmer musicians in the Berkshires. He has played piano/keyboards for numerous musical endeavors, playing with various klezmer ensembles (Berkshire Klezmer Society, Two Cents Plain, The Knaydels), professional and amateur/community theater companies (Berkshire Public Theater, The Theatre Barn, Town Players of Pittsfield, Romance, Soul and Rock and Roll), and has accompanied numerous vocal ensembles and solo artists. Gold is currently the music director at Temple Anshe Amunim and the organist/pianist at the First Baptist Church in Pittsfield. He is also a member of Kesher Shir (Boston Cohort), a group of singers/ songwriters collaborating on writing new Jewish music.